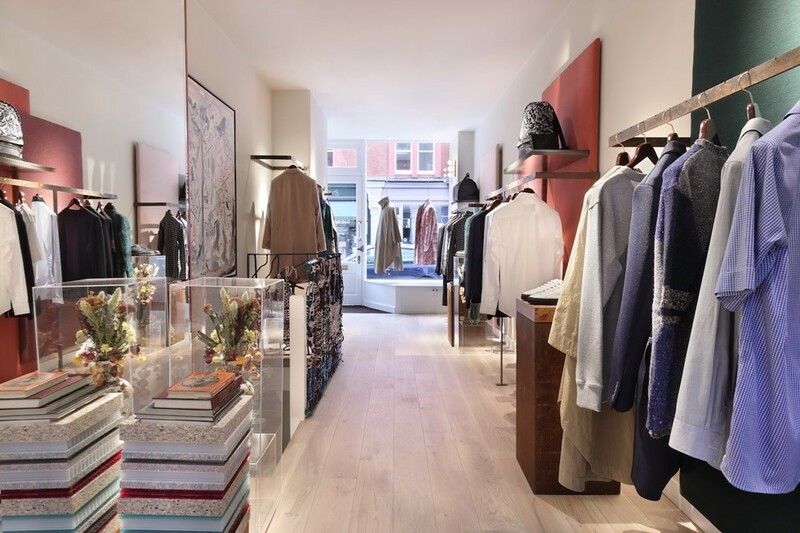 The two-storey shop at 5 Chiltern Street opened on 18 October. It has an intimate, apartment-like feel, and features an eclectic mix of elements that reflect the colourful personality of the brand. Artworks, mid-century furniture and antiques – all of which are for sale – contrast with the store’s unique finishes. The till point, for example, is made from recycled plastic bottles, while the central staircase is threaded with an array of fabrics from the brand’s past collections. The ground floor houses the brand’s men’s and growing women’s ready-to-wear collections and new footwear and accessories offer. The lower floor is dedicated to appointment-only personal tailoring – a growing area for the business. Ready-to-wear trousers and jackets, depending on fabric, range from £195 to £625, while made-to-measure suits start from £1,495. The pair used to present on the catwalks of London Fashion Week Men’s twice a year, but the store underlines a change in strategy – which includes making a break from wholesaling. As a result, the Casely-Hayford brand will now release four seasonless collections every three months in limited numbers. Then, after 12 months, it will shift to every two months, replicating the “drop” format popularised by streetwear brands such as Supreme.